Life Before the Dinosaurs: Akmonistion. Akmonistion (it used to be called Stethacanthus) is a genus of shark that lived from the late Devonian to the early Carboniferous. The male Akmonistion had an anvil-shaped crest instead of a dorsal fin. The crest had barbs on top and Akmonistion also had a triangular patch of spines on top of its head in front of the crest. The female Akmonistion probably looked just like the male, except it might not have had the crest or the triangular patch of spines. 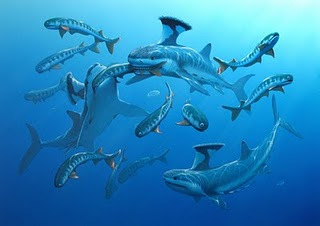 Some scientists think the Devonian to early Carboniferous shark Symmorium might be the female Akmonistion, since no female Akmonistion fossils have been found. Akmonistion probably mated with the female biting the male's crest, like its relative Falcatus. But this is just my hypothesis. 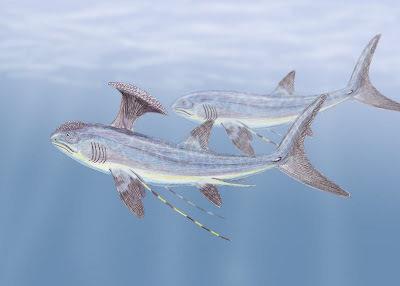 Akmonistion had one long strip on each pectoral fin. No one really knows what Akmonistion's anvil-shaped crest was for. Akmonistion was about three feet long. It is a type of shark called a stethacanthid, which is an extinct group of sharks which had a spiny crest and a triangular patch of spines on top of the head. Its name means "anvil sail" and it was found in Scotland.